At the High School of Fashion Industries (HSFI) in downtown Manhattan, there’s no such thing as a slow day for Site Director Lativa Holder. HSFI is over eight stories tall and home to more than 1,600 students. Teenagers bustle through staircases, pack into elevators and roam through the halls in the busy high school. Almost 200 of these students regularly make their way to Saga’s tutoring classroom on the seventh floor, where they work together to strengthen their math skills in small groups with a Saga Fellow and Ms. Holder by their side. This is the first year Saga has been serving students at the High School of Fashion Industries. Unlike other high schools where Saga works in New York City, HSFI implements both full-dose tutoring and half-dose tutoring. Full-dose students meet with Saga Fellows for a class period every day during the school week, while the half-dose students visit their Fellows for a class period every other day. As Site Director, Ms. Holder’s main responsibility is coaching the 11 Fellows, which includes prepping the tutors how to teach specific math lessons that align closely with HSFI’s curriculum. She is also the first New York Site Director to observe half-dose tutoring and has seen several benefits. Saga tutoring is effective because tutors and the students form strong personal bonds through intense 2-on-1 tutoring. 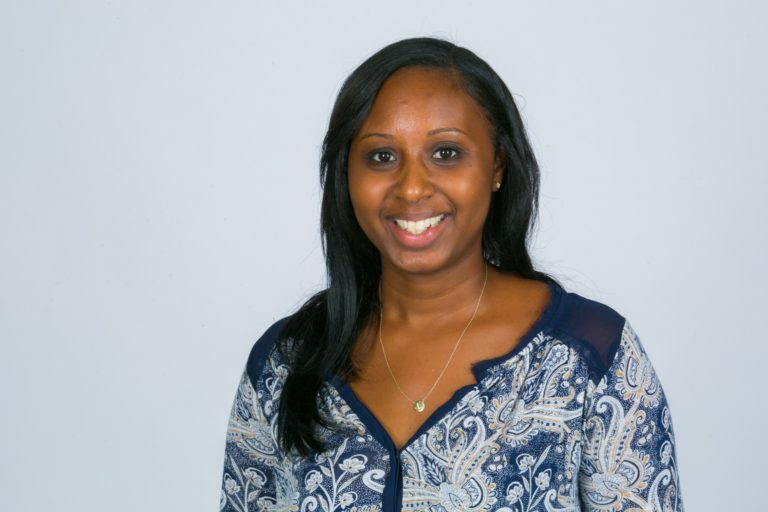 When Saga first started at HSFI, Ms. Holder was concerned that the half-dose students wouldn’t connect as closely with their Fellows and full-dose students. But Ms. Holder discovered that although the bonds of half-dose students didn’t occur as quickly as students with full-time tutoring, they did develop over time and were just as strong as any other Fellow/Student bond she’s seen in her two years with Saga. March 14 (3/14) is also known as Pi day across the world; it’s a day for math teachers and students to celebrate Pi, the famous mathematical constant. Saga challenged the students at HSFI to memorize as many digits as they could. The student who could remember the most digits earned the chance to stuff a pie into the face of their Fellow. It was a fun opportunity to learn, celebrate the holiday, and joke around. The winner, a young female student with a competitive streak, memorized 55 digits of Pi and was given the exhilarating chance to stuff a pie into her teachers face. And throughout all the fun that day, Ms. Holder also noticed something else. 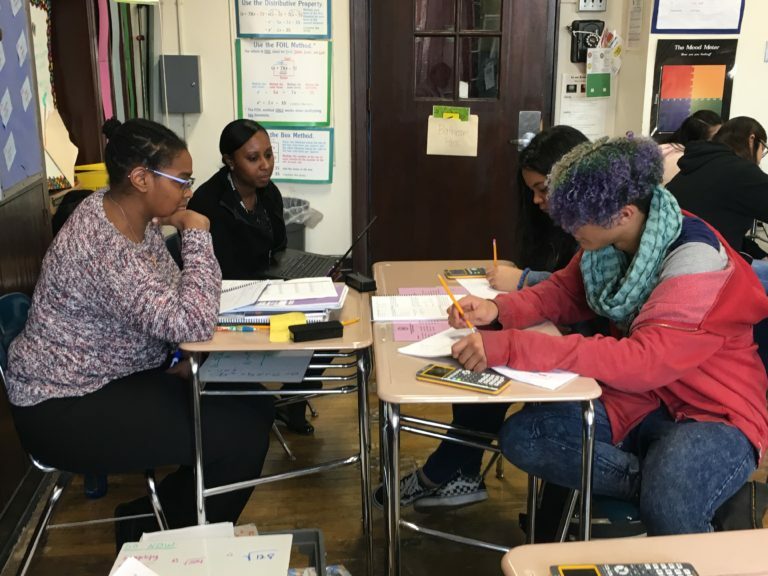 Pi Day was a fun opportunity to celebrate math, but on a normal day at HSFI, the class is dialed in to their math work: Fellows use whiteboards to write out problems while students work out the answers, showing each step along the way. The lesson plans that Ms. Holder implements to the class match closely with the curriculum in the students’ classrooms. To achieve this goal, Ms. Holder schedules curriculum meetings and discusses upcoming lessons and quizzes with teachers, and ensures that the work being done in the Saga classroom directly supports each student’s schoolwork. On top of coaching, Ms. Holder acts as a liaison between the school and the Fellows. Part of Saga’s mission is to provide educational tools to students who otherwise would be without. Ms. Holder knows personally how important this type of access is. Born and raised in the Bronx, Ms. Holder began her education in a low-income area with a school system that lacked resources needed to propel students into college and beyond. Ms. Holder is quick to identify with her students at HSFI. Ms. Holder taught middle school math for six years before deciding to go back and pursue a master’s degree in education. Knowing that the balance between a full teaching load and graduate school would be too much, she left her teaching job in New Jersey and connected with Antonio Gutierrez, the Vice President and Co-Founder of Saga. They had been classmates together at Union College, and Antonio needed someone who could “be on the ground,” working directly with the students and Fellows as they began introducing Saga to New York City schools. Ms. Holder’s passion for education and social justice has brought her a long way, and there’s still more to come. She’s currently a graduate student at Columbia University, where she studies Education and Arts. With a master’s in education, she’ll have plenty of opportunities in the future. But one thing is for sure—she wants to remain inside a school, working closely with students.